Among Tonka Water’s broad product offering is the Delivered Treatment System, or DTS™, an innovative way to incorporate different kinds of equipment into a complete building. Two recently commissioned projects illustrate how different treatment plants can be architecturally unique, but incorporate the same treatment processes. One project ended up with a traditional brick and mortar plant while the other chose the more versatile DTS™ option. Tipping the scale in favor of the DTS™ was the small footprint and easy integration with other on-site elements. Both projects had similar flow rates and treated for iron and manganese. 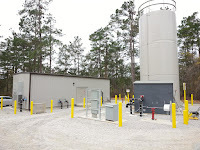 Both projects had low flow rates (around 100gpm) utilizing vertical pressure filters incorporating the Simul-wash™ backwash system to treat for iron and manganese. Although the projects used the same equipment and had similar treatment needs, the DTS™ project proved to be almost 1/5th less in total cost. Choose the cost effective DTS™ for your next project – you’ll be glad you did.